Our full-day Mihintale tour is a combination of hiking and tuktuk-excursions, including all famous sites of Mihintale's sacred hills as well as less-known attractions. You can start this tour every morning at 9.00 o'clock at First House Mihintale. In case you call or mail us, we can provide pick-up service from Anuradhapura or bus stands. 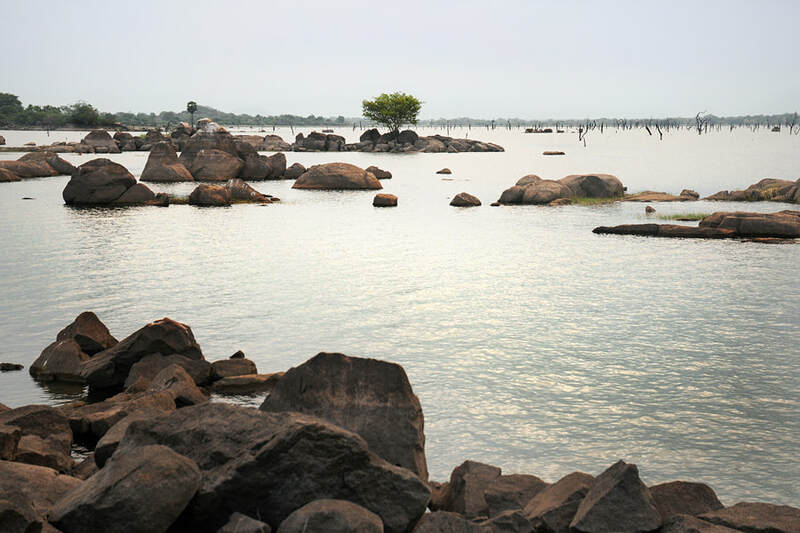 The first part of our full-day Mihintale itinerary is our Mihintale hiking programme. All visiting places of that half-day hiking tour are also included in our full-day excursion. Vedha Sala hospital complex, ancient stairway, Ambasthala dagoba, Invitation Rock, Mahinda's stone bed, Cobra pond, Et Wehera vantage point, Sinha Pokuna lion fountain, Kantaka Chetiya and nearby cave, Kaludiya Pokuna Dark Pond, Rajagirilena Royal Rock Cave, and Mahayanistic Indikatuseya complex. After lunch in Mihintale (or, on your request, after picnic lunch) we will spend the rest of the day by visiting attractions in the surroundings, which can easily be reached by tuktuk (or, on your request by car or by bicycle), walking distances will be short in the afternoon. The following photo descriptions can give you a first impression of this second part of your full-day excursion in Mihintale. After lunch, we will first visit the small Archaeological Museum of Mihintale. It's just halfway between archaeological zone and town center. 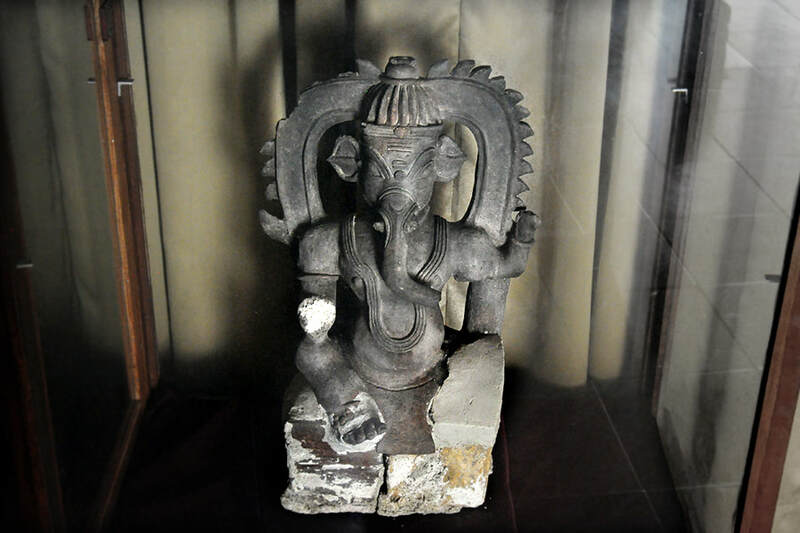 Some exhibits are sculptures depicting Hindu deities, vases are partly imported from overseas. Ancient irrigation pipes are on dispay and sanatory and medicinal facilities are explained as well. Highlight of the Mihintale Museum is the relic chamber of Giribandhu Chetiyas. The original paintings are now sheltered in the main hall of the museum. The next stop too will not be far away from the town centre. We only take a short break to have a view to the new stupa called Anubuddhu Mihindu Mahaseya. It's surrounded by a concrete wall. But there's something special about this edifice. It's a copy of the famous Sanchi Stupa, a World Heritage Site in central India. Sanchi, near the the ancient city Vedisa (Vidisha) was the hometown of Monk Mahinda, who introduced Buddhism to Sri Lanka. Thus, a Sanchi monument makes sense in Mihintale. A place which is actually an ancient site will be our next destination. Mihintale's vast tank called Mahakanderawa is one of sri Lanka's ancient reservoir, it's from the first half of the first millennium A.D. We will drive on the kilometres long ancient dam to a temple wit an ancient meditation cave and a new giant statue of a sitting Buddha. From here, you can enjoy the view to the lake. Be aware, that crocodiles live in this tank and that roaming elephants can appear at it's banks. In only a few hundred meters distance from the Mahakanderawa temple, there is a rarely visited attraction. But this is indeed the best example of a stone bridge from the Anuradhapura period. They resemble megalthic buildings but they are indeed from historical times. The strange construction imitates wooden bridges. But stones had to be used to make the bridge robust in enough to be crossed by elephants. 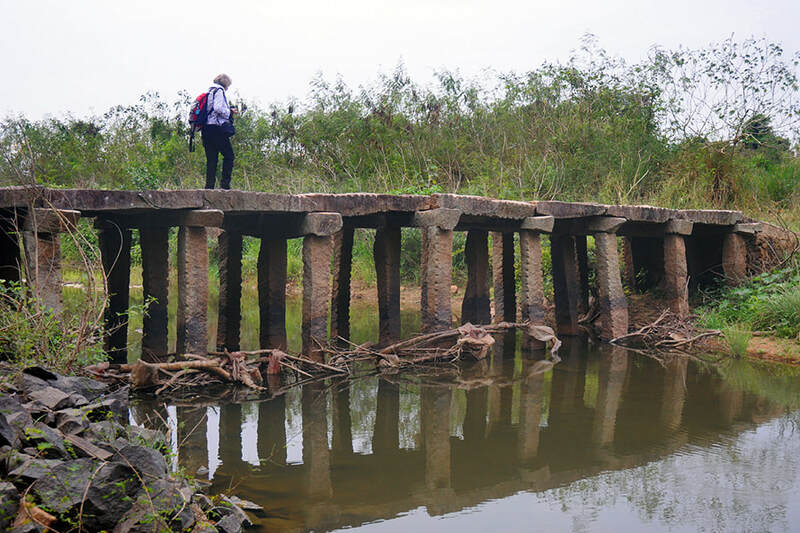 There were dozens of such stone bridges during Sri Lanka's early Middle Ages. The Gal Palama of Mihintale is by far the best preserved of them. Nevertheless, only few tourists find their way to this hidden gem in the remote wilderness of the Kandara river. On the way back to the town centre of Mihintale, we will stop at the A9 highway, to start a short hiking tour to the rocks of Wasammale. This is another place which is almost never visited by tourists, although it's the setting of a famous Sri Lankab story. Wasammala was the hideout of Prince Pandukabhaya. His uncle were searching him, since it had been prophesied that he will kill all of them and become the future king instead of them. 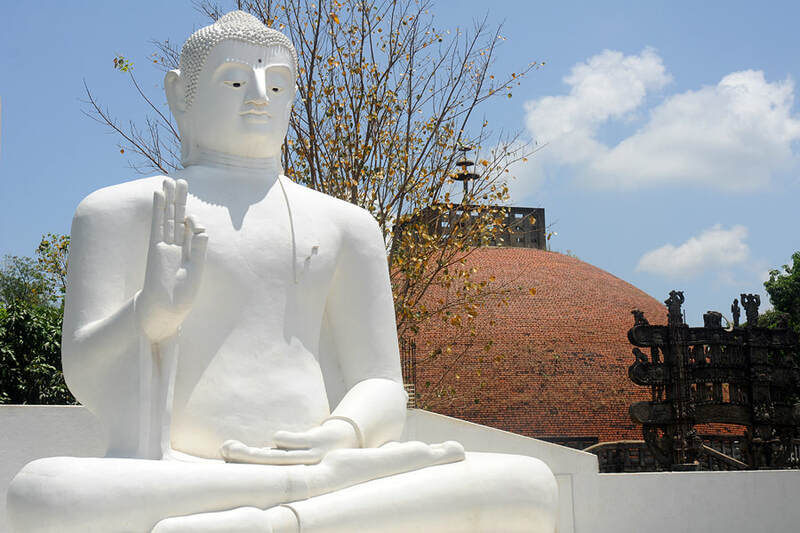 Pandukahabhaya survived all attempts to kill him and after defeating his uncles he became the first king who chose Anuradhapura as his capital. The ponds surrounded by those legends can still be seen. Even more interesting are remnants of rock paintings. They are supposed to be from the Kandyan period. Another place linked to the Pandukabhaya legends is Doramadalawa. 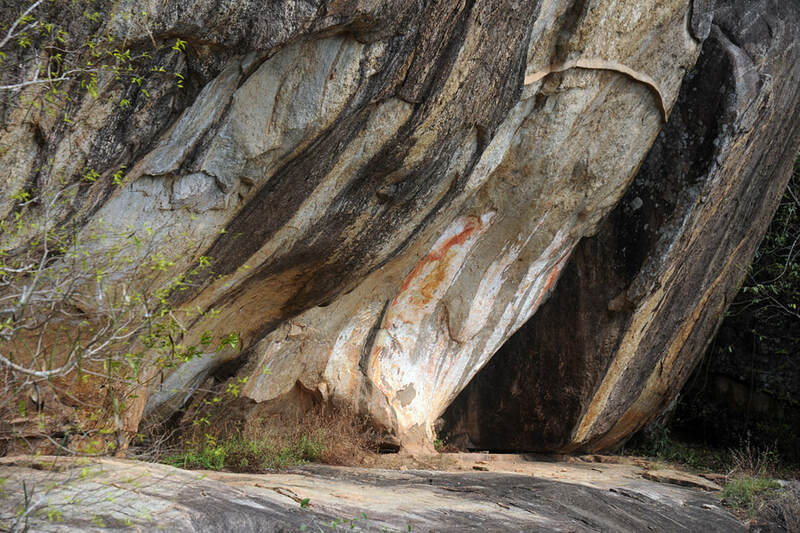 The cave temple is said to have a long tunnel which served as Pandukabhaya's escape route. 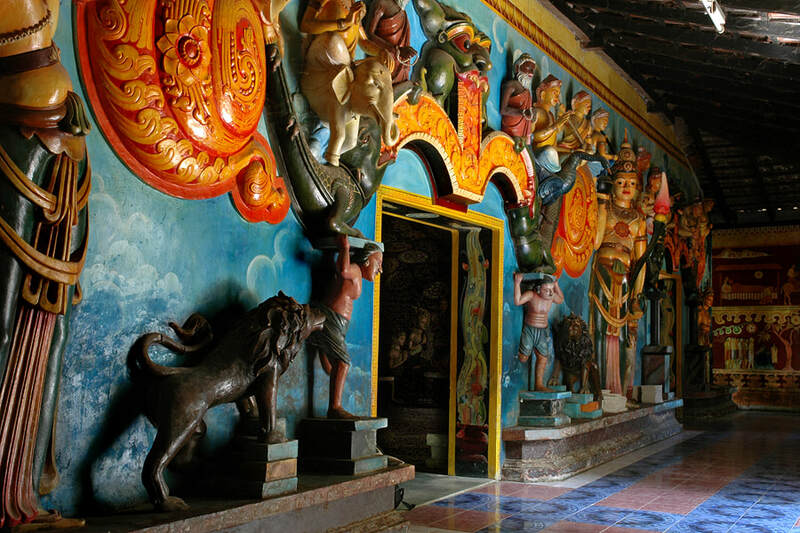 Doramadalawa is a typical Sinhalese cave temple, crowded with colourful Buddha statues. Atop the granite boulder, a small new stupa was constructed. 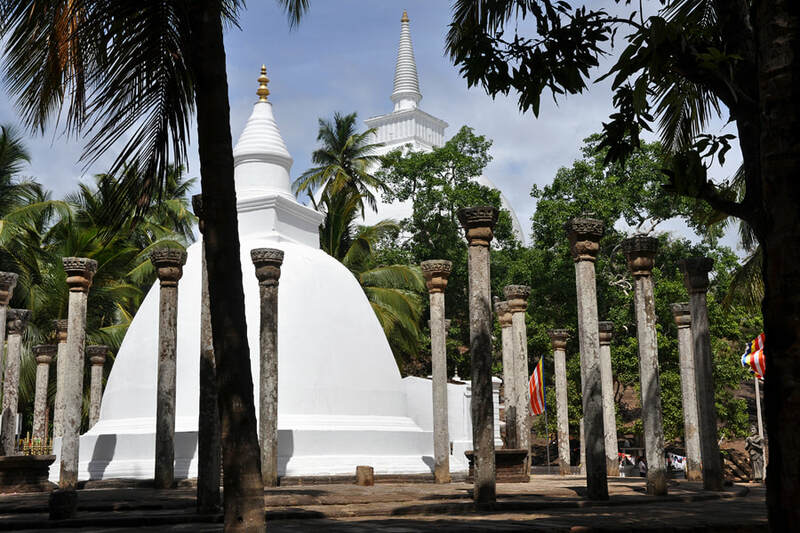 The last item of hour itinerary is Tapovane, which is situated halway to Anuradhapura. 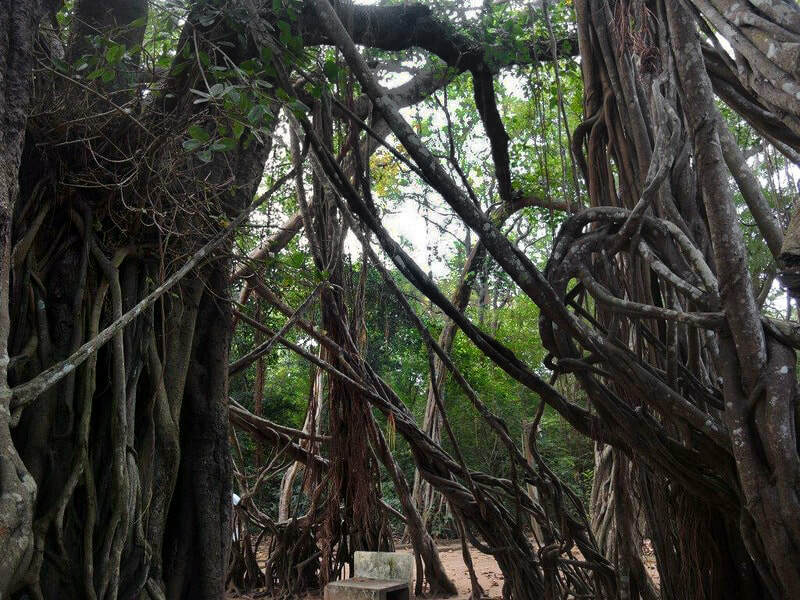 It's the place of one of the most spectacular Banyan trees of Sri Lanka. This single tree has many trunks. They are arranged artificially to form a kind of meeting place wit a sheltered room as the innermost circle. After visiting this holy site, we will return to Mihintale or, on request, to your holiday residence in the Anuradhapura area. We hope you enjoyed your full-day Mihintale excursion and will recommend it.